For me dental care is a sensitive subject but also a really important one. I don't really like my teeth at all and if I could I'd get them professionally whitened, I would and I'd love to do something to fix up my chipped tooth and also my crown. 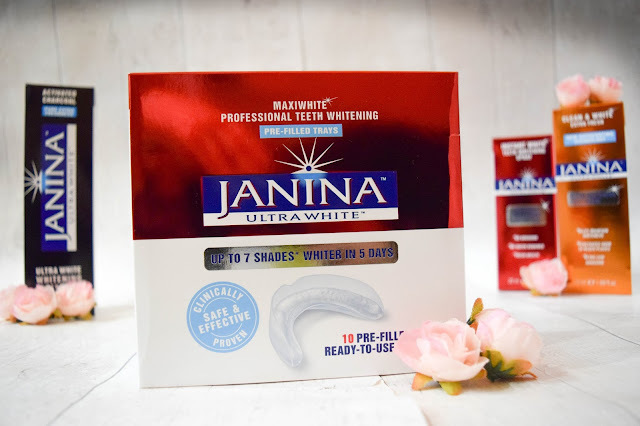 But back to the topic of whitening, I took the opportunity to review the new Janina Ultra White Dental Care Range recently and I'd love to tell you all about it. It's a little bit of a long one, but I'll try to keep it straight to the point! 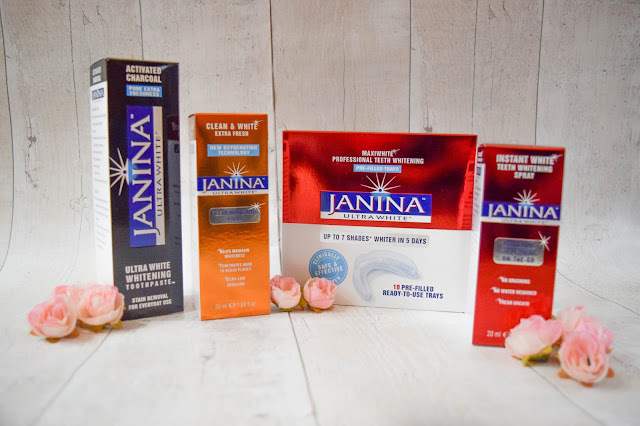 So about 5 weeks ago I was kindly given the new Janina range to try out for myself. I absolutely love trying out new toothpastes and dental products so I was really excited to try some of these things out. In this range I have their newest activated charcoal tooth paste, whitening spray, whitening foam and whitening trays. I'm going to review each product one by one. 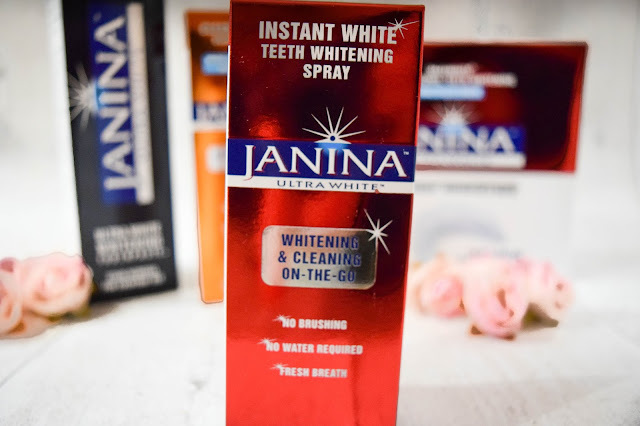 First up is Janina's Teeth Whitening Foam which is a foamy product which you pump onto a dry toothbrush and brush your teeth with just like toothpaste. Out of all the products this was definitely my favourite. 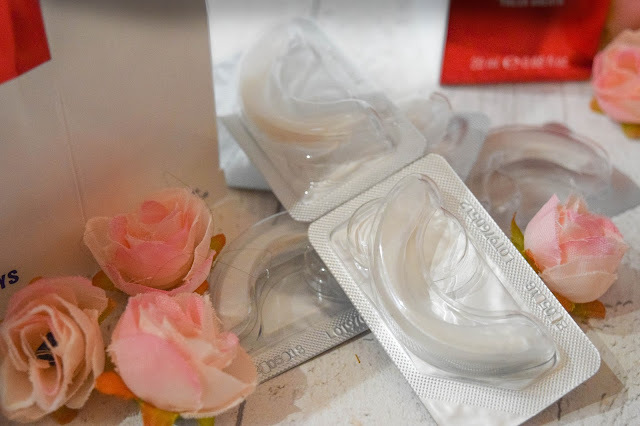 On first impressions I wasn't sure how I'd get along with it because I absolutely hate the feel of foam in my mouth but I definitely saw an upside to adding this to my dental care regime after using it for a couple of weeks. In fact I didn't mind the foam after a couple of days and I got on with it fine. I used this after brushing and was sure to follow the instructions and not eat or drink for 15 minutes after application for maximum results. It's simply a foam version of toothpaste and definitely made me feel like my breath was extra fresh. The fact that it's a foam means it reaches those hard to get places which I really like as I have a couple of those. Being totally honest, I feel like out of all the products, I'm still not sure on how to use this one or if I'm using it right. This is a whitening and cleaning on-the-go spray which you simply spray in your mouth, swish it around before spitting it out when needed. The spray's instructions says you can use just one spray without water but I was using 3-4 sprays and swishing it around my mouth that way as one wasn't enough liquid to swish around effectively. In the last few weeks, it's been useful for on the go for sure, but more as a breath freshener than an instant teeth whitener. I didn't have any expectations for this product but I couldn't help feeling a little disappointed since I didn't notice any instant results, but I did enjoy using it to freshen up in the middle of the day especially after eating. Let's get right into it with this one. Me and this product did not get on well at all. I had a little bit of a mare with this and I absolutely hate to say it because I really, really wanted to love this and was most excited to use these trays of all the products I had. I haven't ever used whitening trays before so I was sure to read all the instructions carefully and follow it step by step to ensure I was doing it all right and I was going to get the best results. On my first attempt I applied the trays and did so correctly. I settled to begin watching an episode or two of the Fresh Prince of Bel-Air but about 3 minutes in I started drooling like a baby and I could feel the product dripping out of the tray... it was not nice feeling. I expected this would happen anyway and so decided to lean forward so the product wouldn't go down the back of my throat and I could last the whole 30 minutes which is how long the tray is to stay on the teeth. I persevered for another 2 minutes before having to give up. I'm a little bit sensitive and physically can't stand the feel and texture of soft and potentially slimy-ish foods or drinks and the gel in the trays was so similar to that texture I can't physically handle. Without going into too much detail, my stomach was churning and I couldn't stand 5 minutes let alone 30 and I had to get rid of the trays and wash my mouth out as quick as possible. I really wish I could have been able to work with these trays but I was too worried about trying it again the next day so I haven't done so yet. Maybe I'll try again another day but right now I haven't got the courage to now from my previous experience. It's not Janina or the product's fault at all so I can't blame them but I can't give them my best most honest review either. It's just I couldn't actually handle keeping the product in my mouth for very long. I'm sorry! I'm thinking maybe I'd get on better with their whitening strips... I've used those before. But not Janina ones. Last but not least it's the product I've been using every day twice a day for the last 5 weeks and it's Janina's activated charcoal toothpaste. When I first used it I really didn't like the taste of the toothpaste when brushing but I loved the texture of it and the after taste. On application it is a thick grey grainy paste and looks just like what you'd expect charcoal toothpaste to look. After a few weeks I really began to enjoy brushing with this and found that the thick grainy paste was doing wonders to remove anything off my teeth that wasn't supposed to be there. 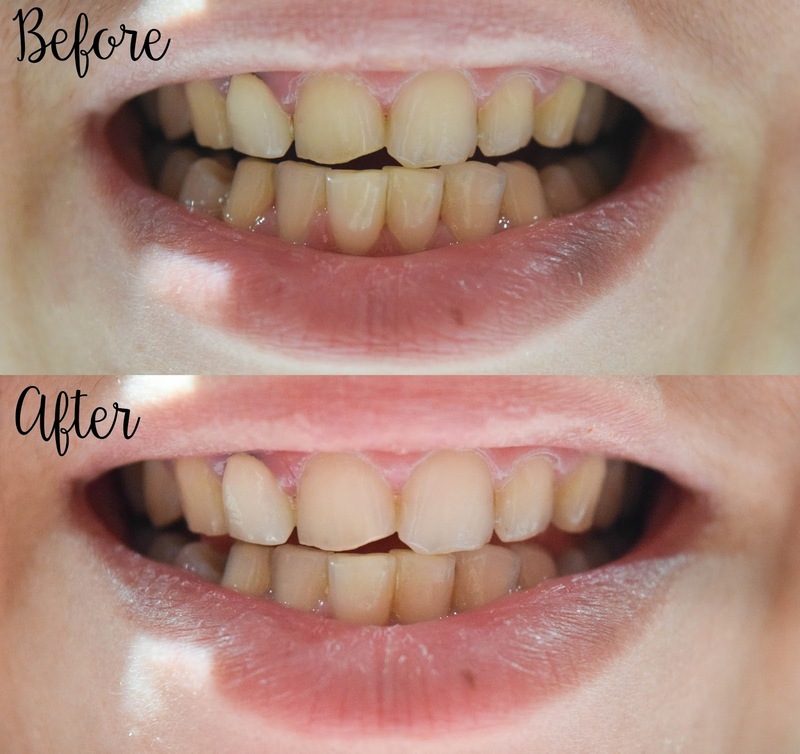 As for whether it worked as a stain removal product, I'd probably leave that for you do judge by scrolling down to have a look at how I got on with before and after pictures that are 5 weeks apart simply because I'm not 100% sure. So here are my before and after shots. I've taken them 5 weeks apart and in the same place with the same lighting, unedited so I think they're as close as they can get to being accurate representations of how it's worked for me over the last few weeks. For me personally, I can't see much of a difference. Maybe in between my teeth it is brighter, but that's all I can tell. What do you think? For me, it's not as white as I'd like it to be but it'll be interesting to see if consistent use of the products for a few more weeks will get it to where I'd like it to be. For me, I need my teeth to be white enough that you can't notice my crown which has been awfully done since it doesn't match the colouring of my other teeth. So if I could get my teeth white enough to make it unnoticeable, that would make me really happy. 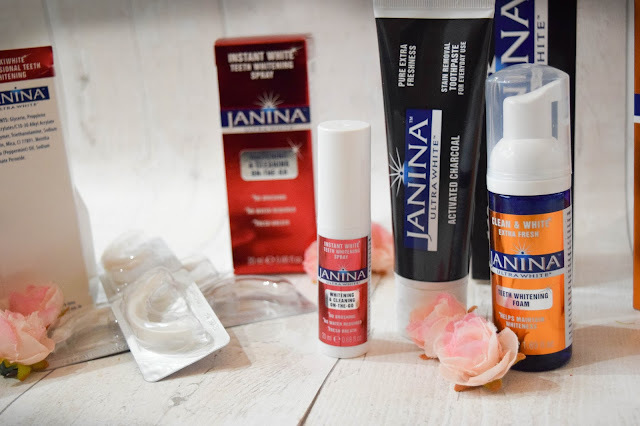 For now, I'm going to carry on using Janina's products in my dental care regime and hopefully see more significant results as the weeks go on. If I see that by the time I've finished them that they're getting my teeth to where I would like them to be, I may repurchase but for now, I'm not 100% sure. I'd definitely buy the foam again and maybe the toothpaste but as for the others I'm not sure. 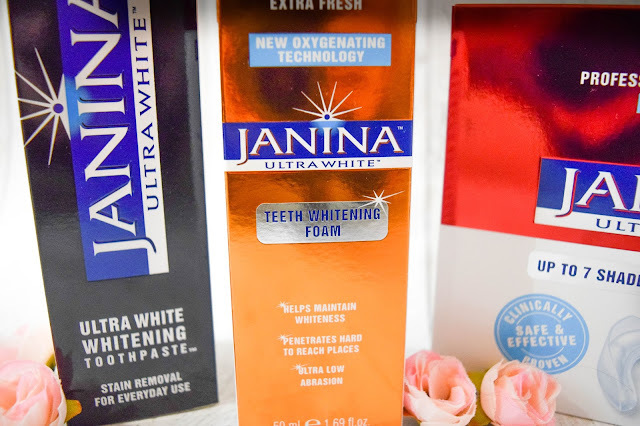 Either way it's a great range and I would recommend trying the ones that tickle your fancy whether it's the toothpaste or the whitening trays! 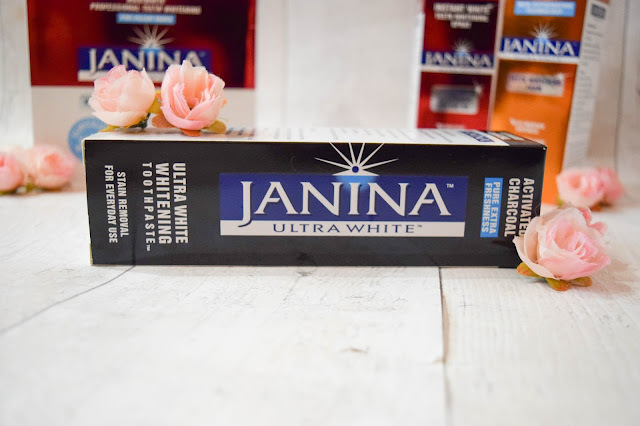 Have you ever tried the Janina Ultra White dental care range? And what do you think about my before and after photos? See any difference? I've never heard of this brand or this kind of whitening kit before! Very unusual with the foaming! I'm currently trying out the White Glo diamond series whitening kit and starting to see a little difference so far.